SONNING’S Blue Coat School U15s ran out county cup winners against LVS Ascot U15s at Maidenhead Rugby Club on Wednesday of last week. 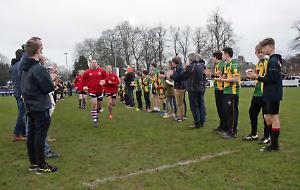 Blue Coat eased to 67-5 in the final in which some of the highlights of the match were David Coleman’s solo try, running in from 40 metres, and the 15-man driving line-out that resulted in captain Tom Price’s try. Elsewhere Jamie Vickery and Harry Clarke scored two tries each while Kieran Burgess, Josh Harris, Charlie Cox, Sam Jolly and Louis Brown also got their names on the scoresheet. Sam Jolly converted four of these tries while Josh Harris added the extras for two.